With 2017 being a torrid year devoid of local hits from the Starboy team except for Manya that took a long time till the festivities in December to properly evolve into a nationwide hit. 2018 offered resuscitation meaning he had to stay away from his usual. He had to explore and discover a new sound that would become his own sound. The WizKid sound. The usual was Afrobeat, It was like WizKid going to the cafeteria and the waiter comes around with the usual, but this time WizKid stays away from it. It had become bad energy. And since the industry had been thriving on trends, WizKid devised a strategy. Hooking up with some of the industry’s new sound guys, he enveloped a sound still retaining the fundamentals of Afrobeats, but this time sounding differently. Wizkid could have told Northboi, “Just play around the beat, add a few twinkling synths and create a new vibe”. And Northboi did whatever the inspiration for the song was, Northboi was the creative mastermind who created a new path some industry heavyweights would follow, a new vibe everyone wanted to recreate. A new melody was birthed. Soco easily seemed like a song you should trash in the bin immediately after the first listen. It sounded lukewarm and obviously was in need of a spark. It lacked the indicators of a hit song. To most people, Soco was really a lackluster tune. Even a few listens after the first, it still doesn’t sound convincing. So, majority of the WizKid FC fans didn’t buy the concept of an alternate sound different from the routine Starboy sound. They wanted to dance, “Manya”, and of course, the year was just starting, let the merriment continue! They wanted to Shaku. They wanted an extended play of Manya. A song they could chant to. Soco was devoid of that, they thought . One even said “It sounded like a nursery rhyme”. Weeks later, Soco had taken over nationwide. We had devised a way to Shaku to it effortlessly and it came out really nice. It had to be played everyday and every night. The radio stations were also on the receiving ends of some Soco demands. Numbers were growing on the streaming platforms The nursery rhyme had become the number one hit song in the country. Overall, it boils down to how WizKid curated a sound that would later become loved by everyone. Truth is, no one follows a new thing until it has been proven to work out fine. The New WizKid sound was an experiment whose formula would later be borrowed by everyone. And to succeed these days, do things differently from the norm, let it work out fine and watch others follow in your footsteps. 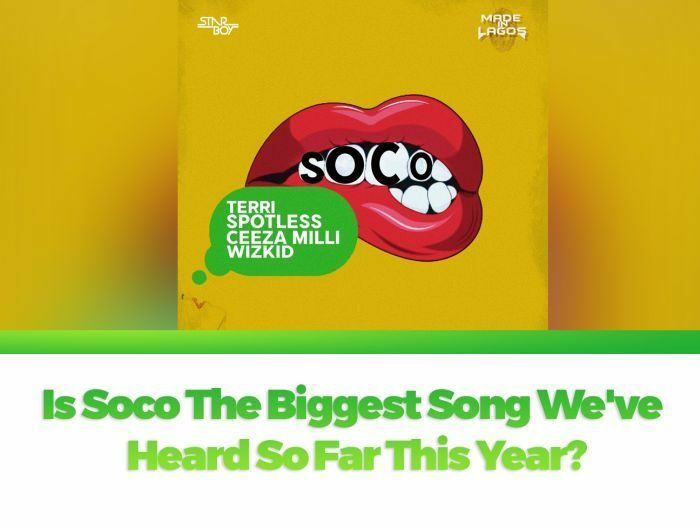 Is Soco The Biggest Song We’ve Heard So Far This Year? Which Other Song Has blown pass Soco? Assurance? Motigbana? Baba? Let’s trash this out in the comments box.